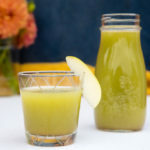 Place the apple, cucumber and ginger through your juicer. Take the juicer container away from the juicer and add the cinnamon to the container. Either stir the juice with a whisk to incorporate the cinnamon or pour the juice into your blender and give it a quick blend.